Below is the cosigned email that I sent to C2E2 and ReedPOP today, expressing concerns about the Saturday badge and the conflicting message it sends about who C2E2 considers their primary audience and who is welcome. We the undersigned are writing to express our disappointment in C2E2’s choice of image art for the Saturday pass (shown in the attached image). We’ve deeply appreciated how welcoming and open the convention atmosphere has been since its inception and many of us have had great experiences at C2E2, particularly due to the convention’s support in hosting conversations about inclusivity and issues of discrimination. Many of us are proud to have taken part in and organized several of those panels and are excited about continuing those discussions this April. Which is why this choice of image for the Saturday C2E2 badge is so disappointing, especially in light of recent missteps by Fan Expo Canada and Capital City Comic Con earlier this month. Many of us have worked very hard to make geek and nerd spaces more welcoming to women and one of the most frustrating barriers to that is how normalized sexually objectifying images of women are in fandom. Images like the one on the Saturday badge contribute to women, who comprise a significant portion of the customer base for fandoms and fandom events like C2E2, feeling unwelcome and disinclined to attend. We don’t believe that there was any intent to discourage women or make anyone feel unwelcome at C2E2 through the choice of this image. However, intent is not the same as impact, and the fact that this kind of objectifying image is not uncommon in comic or gaming art is part and parcel with many of the issues of concern to women in geek and nerd spaces that we are trying to address. The message this image on an official event badge sends about who is welcome at C2E2 and who C2E2 considers to be its audience, however unintentionally, is troubling. For many, wearing the badge is likely to be a source of discomfort rather than pride and it regrettably undercuts the idea that C2E2 is the kind of convention that everyone can feel comfortable and welcome at, regardless of gender or appearance. C2E2 has been a convention we enjoy and we have encouraged many other people to attend, based on our own positive experiences. It’s our sincere wish that ReedPOP will take these concerns into consideration so that C2E2 can continue to live up to that reputation. We still look forward to attending this April and participating in the convention as panelists, guests and attendees. 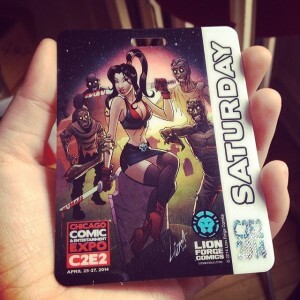 This entry was posted in Cons, Culture and tagged C2E2, Saturday badge, sexism, sexual objectification by Michi Trota. Bookmark the permalink. MODERATION NOTE: This comment thread is open to anyone who wishes to cosign. For discussion about the badge artwork, please take it over to yesterday’s “This Is Why We Can’t Have Nice Things” post. Any comments not adhering to these guidelines will be fed to the Sandworms. Thank you. Count me in as another cosign! I will cosign as well. This is so upsetting. Thank you, everyone. Really appreciate the support! Cosigned. This makes me reluctant to attend honestly. Hi, everyone. I have an update: C2E2 responded today to the letter and I’m thrilled to say that their response was such that I hold no reservations about encouraging people to attend the con. I’m waiting for permission to post the response in whole, but essentially, they apologized, said they agreed with the criticism and regretted not putting more consideration into the image. While they can’t recall the badges, they will have an alternative badge for people to choose from (and for people with pre-ordered badges to trade in for). It was a well-worded, straightforward acknowledgement of their error with (I think) a solution demonstrating their sincerity toward doing the right thing. I’ll likely have a blog post up about it after Chi-Fi is over this weekend. I’d like to thank everyone here for their support, you guys made a difference! Have you seen this years?